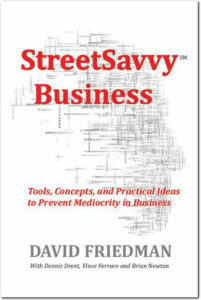 October 14th, 2017: Berkus Press released its fifteenth book, “StreetSavvy Business” by David Friedman today, continuing the expansion of Berkus Press with books by authorities in early stage and mid-sized business management. From its start in 2009, the Berkus Press has published fourteen books by Dave Berkus, often co-authored by other well-known personalities in the business world or early stage investment community. Distributed through Amazon, Barnes & Noble and booksellers everywhere, Berkus Press books have been distributed in North America, South America, Asia and Europe.